Plan de Paris a l'Echelle de 2 Millim, pour 25 Metres, Indiquant les Nouveaux percements et les changements de noms de Voies publiques avec plans supplementaires pour Les Bois de Boulogne et de Vincennes. 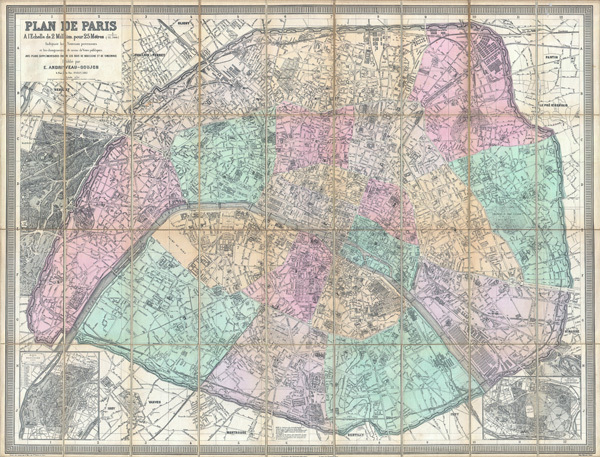 A stunningly executed 1882 large format folding pocket map of Paris, France by E. Andriveau-Goujon. Focuses on the old walled center of Paris from Neuilly in the northwest to Pantin in the northeast, Issy in the southwest, and Ivry in the southeast. Inset maps detail the gardens of Bois de Boulogne and Bois de Vincennes. Offers extraordinary detail of the city on a scale of 1:12,500. Details individual buildings, streets, monuments, gardens and palaces. Shows exceptionally remarkable attention to detail in the public gardens where subtle expressions of landscape design are apparent. Predates the Eiffel tower. Color coded by arrondissement. Engraved by P. Mea of 70 Rue St. Victor, Paris for E. Andriveau-Goujon of 4 Rue du Bac, Paris, 1882. Very good condition - no notable flaws. Detached from but accompanied by original linen binder. Disected into 37 sections and mounted on linen. Original linen backing in excellent condition.